The Big Mountain gloves feature Marmot's Membrain® waterproof/breathable fabric as well as safety leashes and a nose wipe. They are designed with excellent moisture transfer for extreme adventures. The Marmot Big Mountain gloves appear to be very well made with the kind of durability needed for mountaineering. 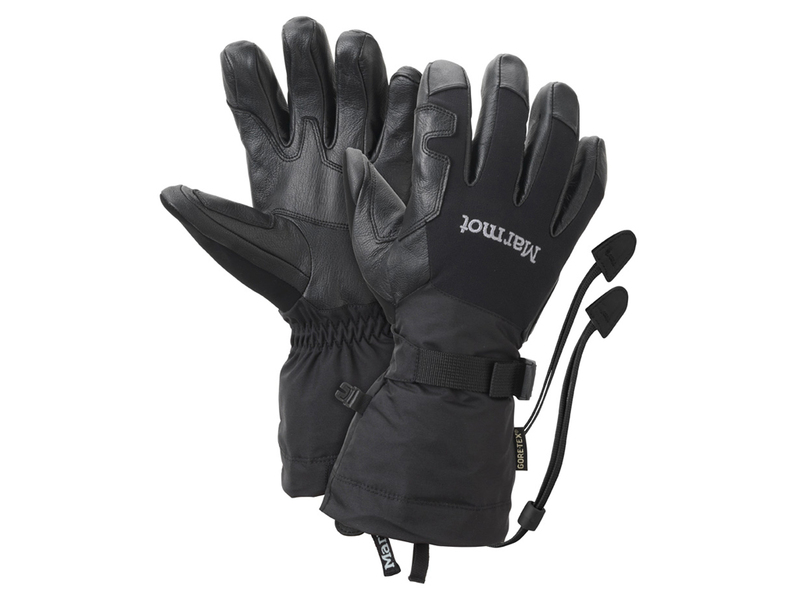 The double stitched seams and combination of technical materials make these gloves well suited for harsh environments. I find them very comfortable and true to size. I am able to wear them alone or with a thin liner glove inside. The softshell fabric over the knuckles is a nice touch, making the gloves more dexterous. The Big Mountain gloves weighed in at 8.1 ounces on my scale. That's less than the weight listed by Marmot, which is a first in my experience. Hopefully that doesn't mean the insulation is light. The safety leashes are easy to use and will be very helpful keeping the gloves from flying down a mountain. Securing the gloves with the gauntlet drawcord is very easy with gloved hands and just as easy to loosen. I love the design and look forward to climbing in them. I tested my Marmot Big Mountain gloves on a recent snow hike on the lower slopes of Mt Hood. The weather was in the mid 20's F with light snow and gusty winds. I made it through most of my hike needing only a mid weight liner glove, but once I was out in the open on steeper slopes my fingers started to freeze. Luckily they warmed up quickly after putting on the Big Mountain gloves and remained warm through the rest of my hike. I really liked how comfortable they were gripping a trekking pole in one hand and an ice axe in the other. The gauntlet drawcord closure is one of my favorite features. It is so easy to use and extremely effective at keeping the weather out and heat in. The outside of the Big Mountain gloves stayed dry and the inside didn't feel wet (until I got home) even though my hands were sweating. So far, I feel the Marmot Big Mountain gloves are a great piece of gear. See McNeil Point adventure where the Marmot Big Mountain gloves were used.